Industrial and commercial buildings have unique needs. These are the products that work best with these types of buildings, over our other metal roofing materials. If you need a consultation to help you determine the best products and materials for your particular building’s needs, give us a call at 800-674-3434 and we’ll inspect your roof, with images to back up our recommendations and answer any questions you have. On this page, we’ll go over the specs and benefits of the products that work best with commercial and industrial properties. A material that can handle just about any situation, Snap-Loc commercial standing seam has 24″ width and 3″ high ribs. Mostly for commercial needs, it can be used for roofing systems that have slopes as low as 1/4:12, working well for most low sloped roofs. It saves in expenses, time and reduces waste, being cut to the half inch. Snap-Loc utilizes a concealed clip fastening system. Can be installed over open framing, making it a great choice for steel structures. A full line of trim and accessories is available. For commercial applications, R-Panel is one of the most commonly used metal roofing material. It can cover larger distances with its tall 1 1/4″ ribs. Slopes as low as 1:12 can use it. They will be custom cut to the half inch. Meets the most stringent building codes. colors, ensuring that you can find something to fit the design of the building. This is one of the more popular panels in use. They’re a great choice for both commercial and residential uses. It’s one of the most economical panels to choose from. GrandRib 3, Panel-Loc Plus and MasterRib are some of the brands used. It’s a durable and economical and available with 40 year paint warranties. They have great energy efficient qualities and a lot of colors to choose from. They can also be custom cut to the half inch. Durable and Strong – from its metal to its baked on paint finish, it’s an extremely durable option. We use high quality steel, coat it with aluminum, prime it coat it with a baked-on enamel siliconized paint system with a 40 year warranty, then roll form it to the length needed for your roof. Cut to the 1/2 inch, which saves on materials and time when they’re installed. There is also a varied number of accessories and trim to choose from. Watertight – There’s a built-in water siphoning channel, which moves rainfall down it and off your roof. Curb Appeal – available in a wide array of colors to match any architectural need. Economical – It’s one of the more affordable metal roofing panels. With the ability to be installed over open framing or solid decking and 1 3/4″ ribs makes for a very strong material. Hidden clips are used to fasten it, allowing for greater contraction and expansion of the panels and resistance from the wind. They meet the most stringent high wind requirements. They also come standard with the ability to come flat pan and eliminate oil canning. Vertical Seam utilizes a concealed clip fastening system. Low maintenance and easy installation. Great for new construction or re-roofing projects. Crisp and Defined – Through history, standing seam has made its name through brute strength and striking beauty. Vertical Seam is no exception to the rule. With its 1-3/4″ tall ribs, Vertical Seam will add value and beauty to any residential or commercial project. Strength of Steel – Made of high tensile steel, then coated with multiple quality coatings, Vertical Seam metal roofing can take it. Whether its high winds and hail in Texas, or hurricanes in Louisiana, Vertical Seam doesn’t back down to any weather challenge. Low Slope Roofing – Vertical Seam can be installed on roofs with a slope as low as 1:12 over solid decking, or 3:12 over open framing. 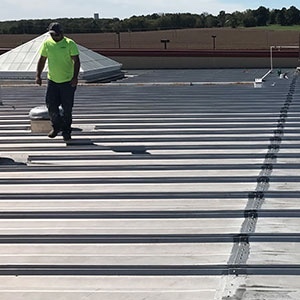 This is lower than most standing seam roofs, offering complete protection even when your roof only raises one inch per every twelve inches across. Standing Seam is a premium metal roofing product. This high quality metal roof system is designed to hide the fasteners, creating a beautiful roof with the durability of steel. This panel is factory cut to the half inch. Many of our colors are Energy Star rated for great energy efficiency. Image II is formed standard with striations to eliminate oil canning, but is also available with minor ribs at some locations. Please ask your representative which options are available in your area. Completely Concealed Fastened Roofing – Image II Standing Seam utilizes a concealed fastening system which requires no clips, so installation is quick and easy. Image II requires low maintenance and easy installation. Because you don’t have to put down clips installation over solid decking is a snap. Whether you have a new construction or re-roofing project, Image II will work on either. It’s Beautiful – Standing Seam is available in a variety of colors to match any home. Whether your home’s walls are vinyl siding, brick, or almost any other material, we have a color that will compliment it. Its Versatile – Image II looks great and performs on many application types. From residential to light commercial, Image II is a great choice. Lots of Trim and Accessories – We have color matching trim and accessories for Image II to finish off your project. From ridge cap to fasteners to pipe boots and everything in between, we have it. Taurus Elite Commercial Roof Systems, 800-674-3434, provides commercial roofing services to Austin, Texas and the surrounding communities. This includes commercial metal roof repair, commercial metal roof restoration and commercial metal roof replacement. We have been providing professional commercial roofing services to the area for over 20 years. 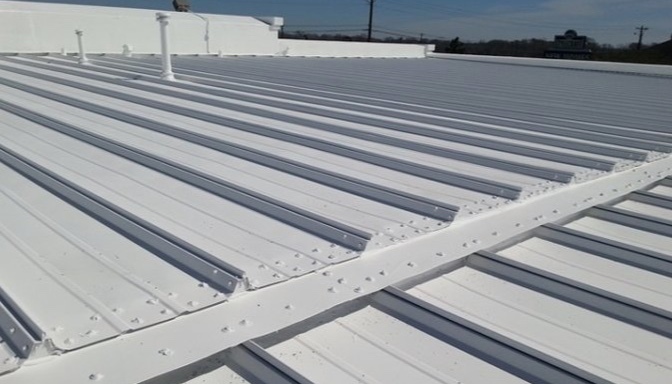 No matter which material you decide to use on your commercial metal roof, we’re here to answer all your questions and use our expertise and experience to ensure that your commercial metal roof replacement is completed successfully.